I love books. I loooooovvvvvee books. I always have two or three going at the same time. And then I can't wait to share books with people I love. So, today I get to share a new book with you! I received this book in exchange for my unbiased review. I would never recommend something I did not find extremely helpful! I had the opportunity the past few weeks to enjoy a newly-released book, written by a friend. Reading a book by an author you know personally can be an interesting experience. I am happy to say that Lisa Pennington, the author of Tightropes and Teeter-Totters: Finding Balance in the Ups and Downs of Life, is authentically the same person in these pages as she is in real life. She is funny, transparent, intentional, and in love with Jesus. 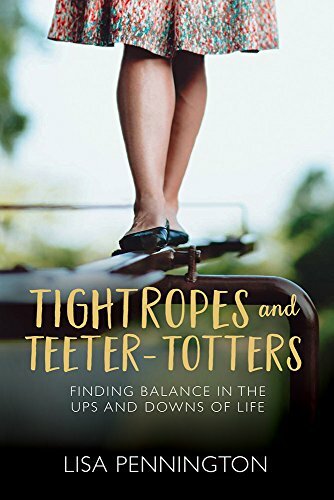 Tightropes and Teeter-Totters includes both the whys and the hows for achieving more balance in the varied aspects of a woman's life. Balance is an elusive goal for most of us. Her definition is, "Balance is the result of an intentional reaction to an extreme situation." (p. 22). That is exactly what crazy times need, intentional responses. Lisa uses the word as an acrostic to teach measurable steps to work towards stability in the storms of life. Included in between the covers of the book are steps to find balance in marriage, motherhood, friendships, money, moods, and more. Lisa is not afraid to address areas most of us would rather she just left alone. But as I read, I realized finding balance in one area requires me to bring all areas to Jesus. Even the ones I don't want to talk about. My equilibrium rests on His foundation and therefore needs His truth. Lisa's steps in each chapter helped me find that. This book is an easy read, but with meat to chew on. I thoroughly enjoyed the book and recommend it highly. I have several takeaways that are already making a difference in my responses. Buy "Tightropes and Teeter-Totters" and find balance for your life. If you read it, let me know what you think!. Find this book on Amazon: This is an affiliate link, which means I would receive a small compensation if you clicked over and bought from here. Your price is the same.